Mindful Nutrition with Megan here! Have picky eaters at home? My toddler struggles with protein more than anything else! Sometimes I feel like I’ll give in to anything she wants just to get her to eat some sort of protein source, but we know that isn’t the right answer. When it comes to picky eaters the last thing you want to do is give in and become the next “short order cook”, however it’s important to make sure your child is getting those nutrients. Adding protein powder to foods is a great fix for our family. Not only does it provide a healthy source of protein and fiber but it’s kid approved in taste too! 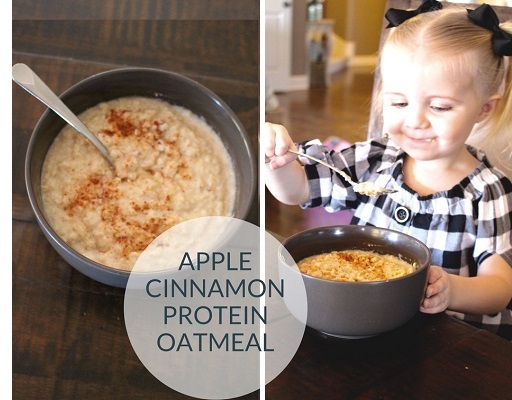 Try this Apple Cinnamon Protein Oatmeal with your family, it won’t disappoint! Mix CardioWhey, oats, liquid source, and applesauce in a serving bowl. Microwave oatmeal mixture following oatmeal container’s directions. Stir mixture and dash with cinnamon on top.